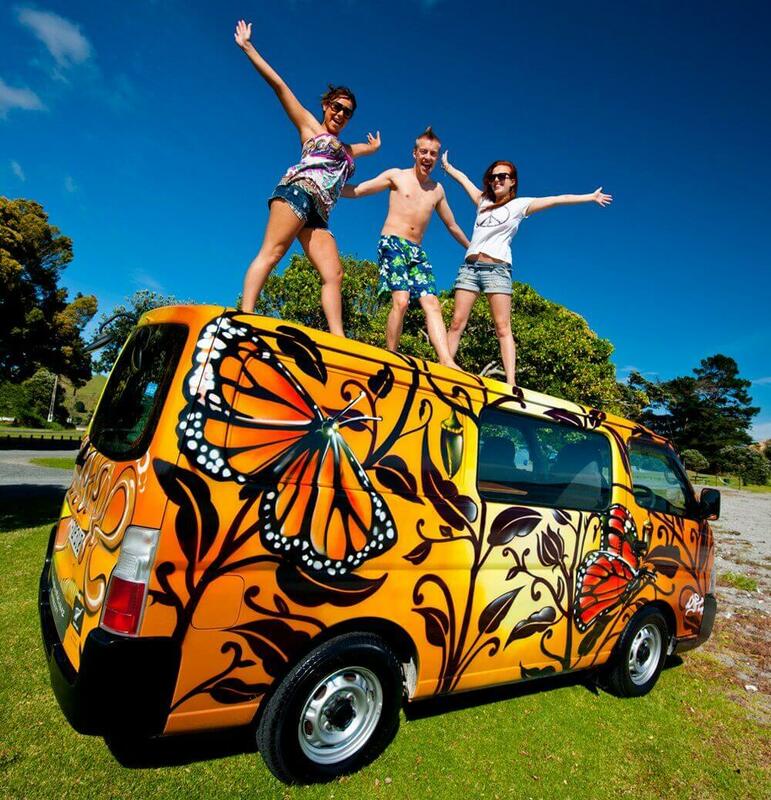 Campervan Hire NZ – Popular Campervan Rentals at Affordable Prices. 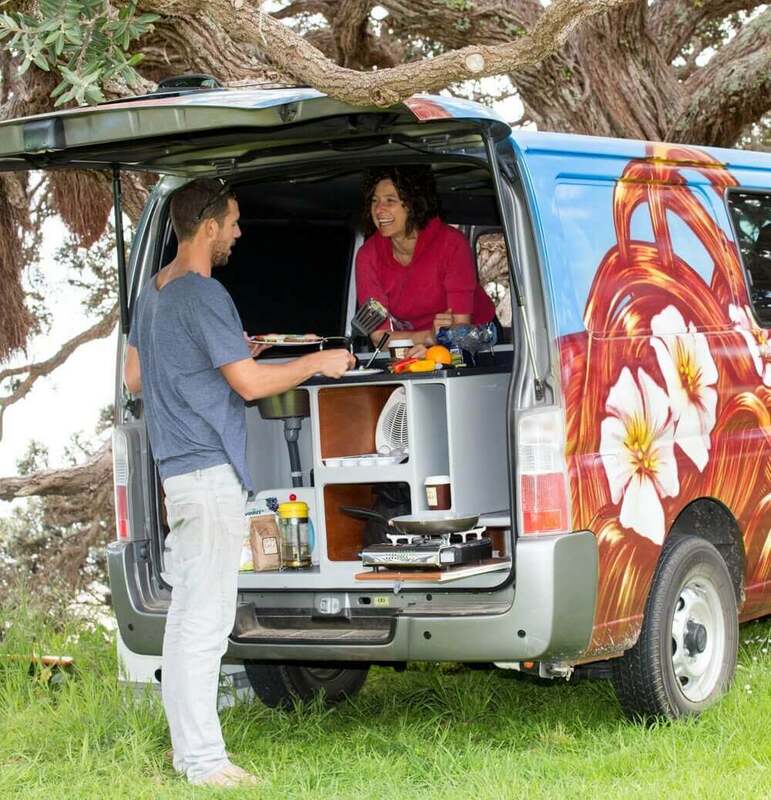 Escape Rentals is one of New Zealand’s favourite campervan hire companies. We’ve been operating for nearly twenty years and over 30,000 happy hires. 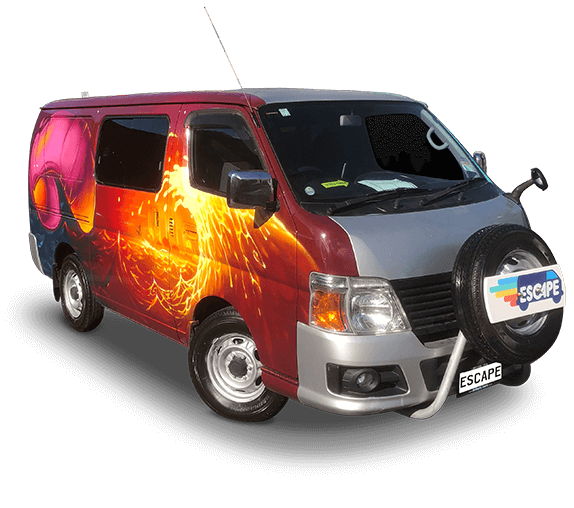 Escape provides reliable, cheap campervan rental vehicles for backpackers and independent travellers. 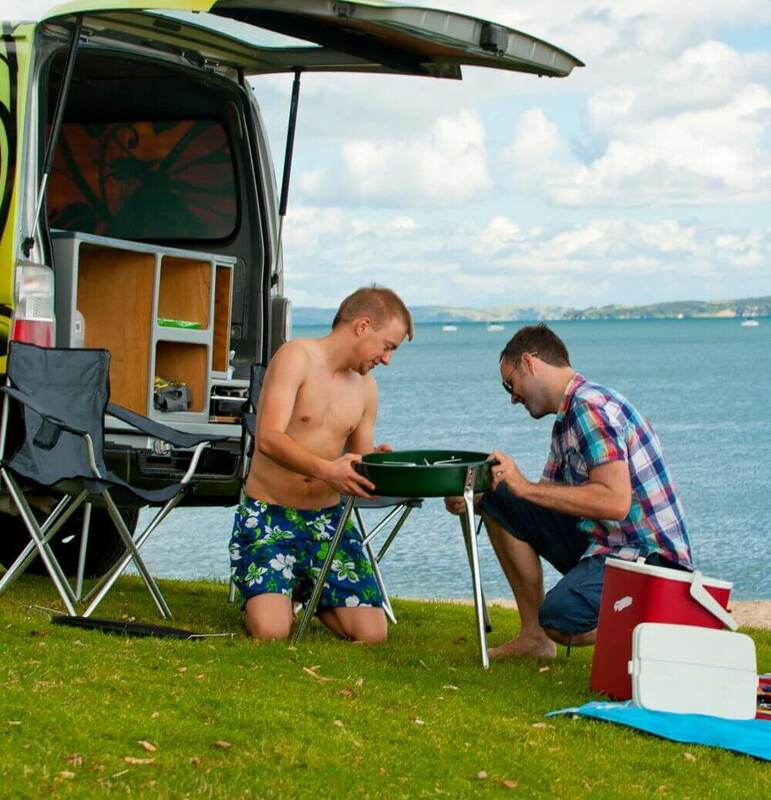 Each of our campervans accommodates up to 3 adults and are fully equipped with free bedding, beach chairs, kitchen facilities/utensils and more. We’re a popular choice for international backpackers, so ‘Make your Escape’ and choose Escape Rentals for your New Zealand road trip adventure. We constantly check our competitor’s prices to ensure our rates are lower and our hires are getting great value for money. We even price-match comparable campervans so you know you’re getting a great deal. 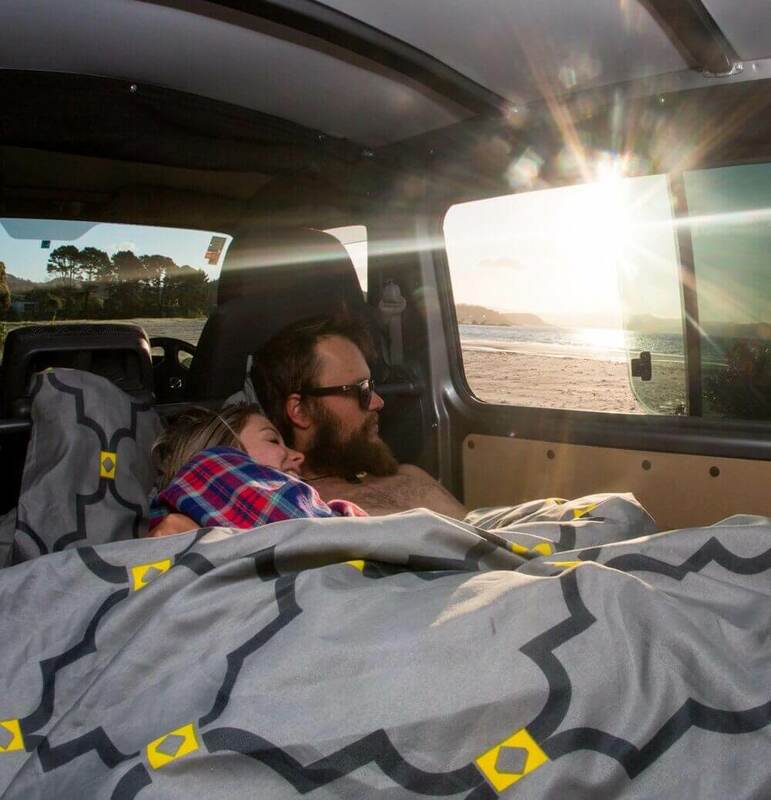 Each Escape campervan is unique with over 200 designs to choose from – That makes Escape vans perfect for that selfie or Facebook post. 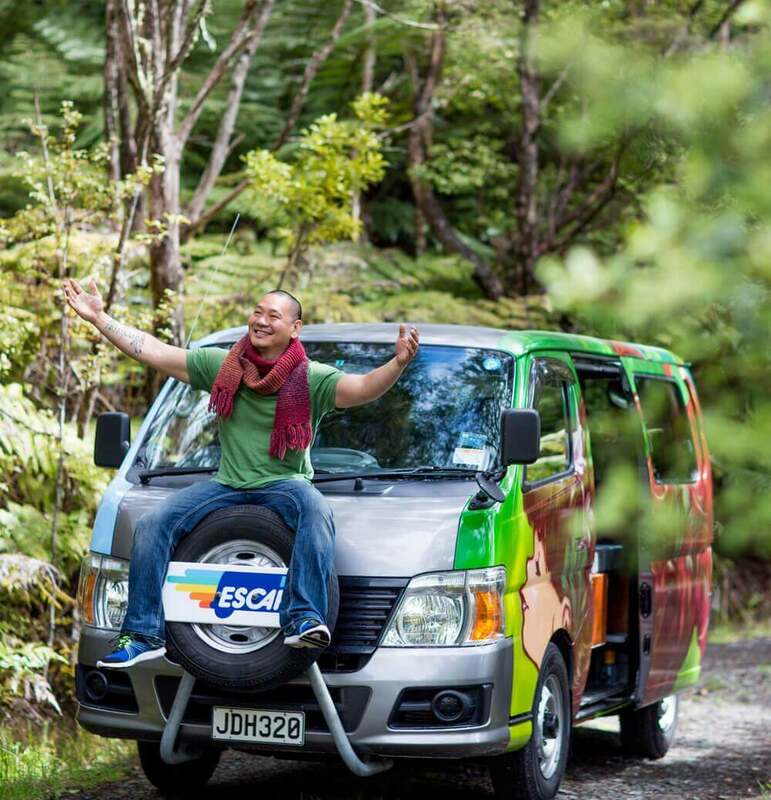 You’ll also feel like part of the wider Escape community as you travel New Zealand. Our campervans are designed for travel – they’re rugged, reliable and easy to drive. We care about comfort, offering a queen size bed, a dining area and a kitchenette. We also have self-contained campervans for more camping options and flexibility. Our depots are conveniently located close to the city centres in both Auckland and Christchurch (a 5-10 minute walk). One way hires are OK and we can even help with a discounted ferry crossing. We also provide 24 hour roadside assistance. Escape Rentals is trusted and highly recommended on major review sites, with many authentic and positive comments relating to our product and service. We’re proud of that. Great value and better coverage (including driving on unsealed roads) yet our insurance is easy to understand and entirely fair and reasonable. No nasty surprises and no hidden costs. 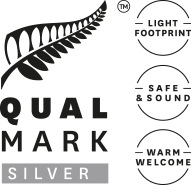 We’re a typical Kiwi business – friendly and family owned. However we still take our responsibilities as a trusted campervan operator seriously, which is why we are Qualmark endorsed. This means we deliver what we promise and if there is an issue – we get it sorted. Simple paperwork. If you choose our basic insurance, your bond is frozen only (no cash deductions) and released immediately when the van is returned. As travellers ourselves, we know that ‘stuff’ is important. Travelled both islands in style in the Godzilla camper through August and September and couldn’t recommend it enough! The best way to see this beautiful country. Van was in great condition and the staff at Escape were friendly and helpful. Hope to come back again some day! Rented van for 3 weeks. Had a brilliant time in what must be one of the most civilised countries in the world. Not a moments trouble with the van. In fact, it’s probably the only way to see NZ. Had days that will be remembered for a lifetime. Krispy a mine of information in Christchurch. Priceless. 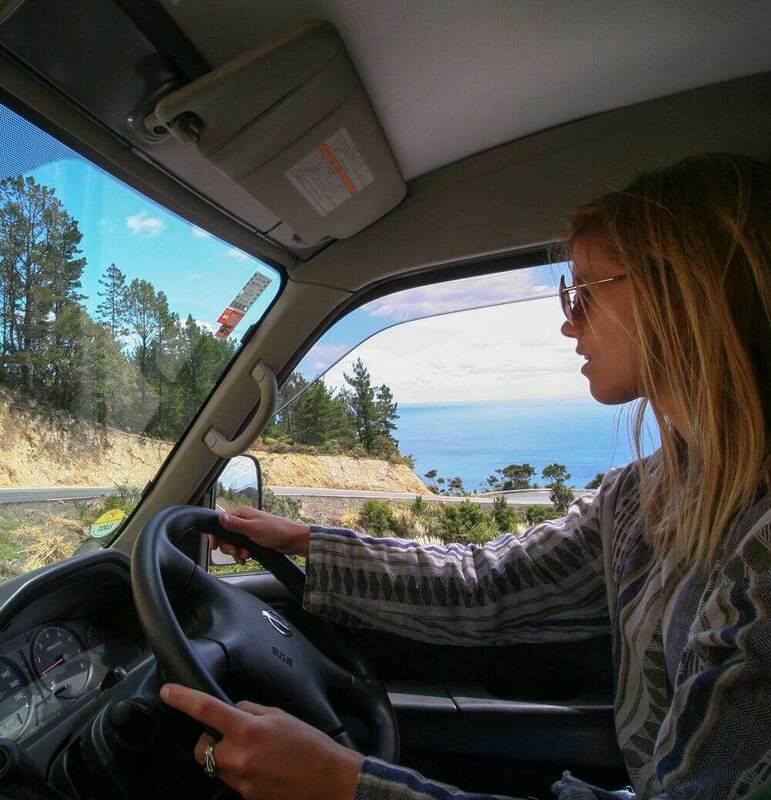 We really enjoyed New-Zealand thanks to our great campervan ! Each design is unique. The campervan worked well, we had no problems. Full insurance allows you to drive on unsealed roads. Price was really correct. It was our first experience driving left, it was fun and easy ! Kiwis drive safely so don’t be afraid. Enjoy ! Thanks for an amazing way to travel new Zealand, picked it up from Christchurch service and knowledge of places to stay and things to see we’re great. The van was in very good condition great to drive and the decorations were great. Highly recommend Escape a rentals to anyone. 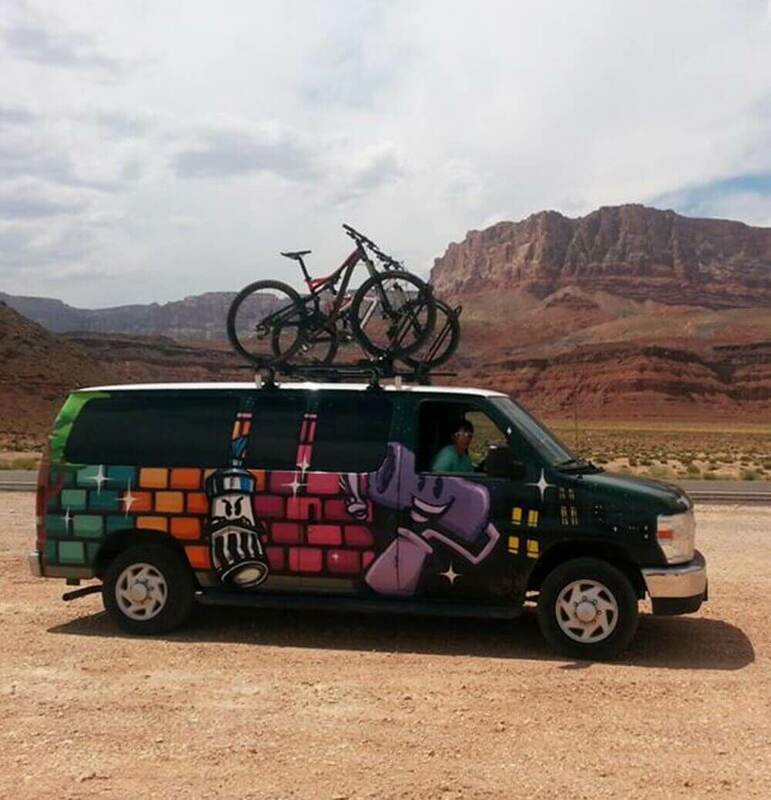 Having one of these vans is definitely the best way to see this beautiful country. Me and my better half picked up our van from the Christchurch depot. Straight away met with friendly faces and advice. Krispy explained all about the DOC sites and how they were in the most stunning locations. Two models. Hundreds of designs. Thousands of happy campers. 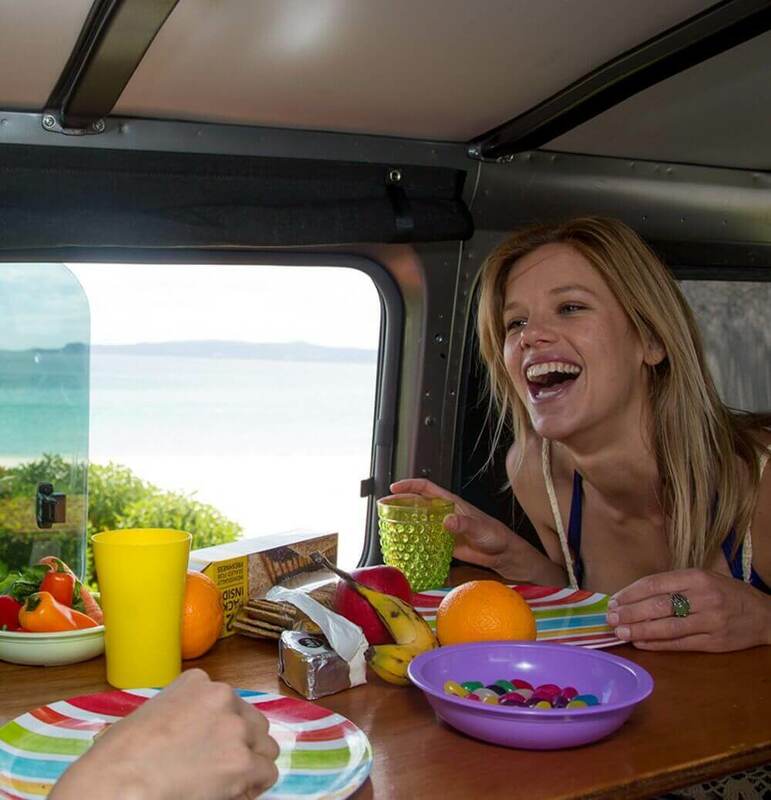 Check out our range of campervans here. Interior layout. Van specifications. Inclusions and optional accessories. It’s all here… and more. Watch How Cath and John made a Great Escape! New Zealand is the perfect destination for a self-drive holiday. Drive for a few hours and you’ll go from cosmopolitan cities to golden sandy beaches. From lush rainforests to rugged mountain ranges. It’s all about the journey in NZ. Cath and John escaped with us in 2013 and sent us this brilliant video of their epic North Island road trip. Love your work guys! Travelling to USA or Australia? It removes all risks associated with late flight arrivals. A late arriving flight may mean you miss our opening hours and get charged for the first day of hire, even though you can’t collect your van until the following day. Remember, it takes about 45-60 minutes to check out your van (paperwork, van familiarisation etc.) so you’ll need to be at our depot by 3:00PM (Monday to Friday) or 2:00PM (Saturday and Sunday) at the latest. A late pick up MAY be available on request (not guaranteed) but this costs $125. You should use that money for accommodation instead and get an early start with us the following morning. Getting through airport customs can take a while when you arrive in New Zealand and traffic in Auckland and Christchurch can be quite troublesome at times. Don’t rush. Plan for these sorts of delays, get some accommodation sorted and we’ll see you in the morning. Safety. This is the big one. Just got off a long flight? It’s better to rest than to embark on a road trip in a different country with different driving conditions and an unfamiliar vehicle. Please rest first. 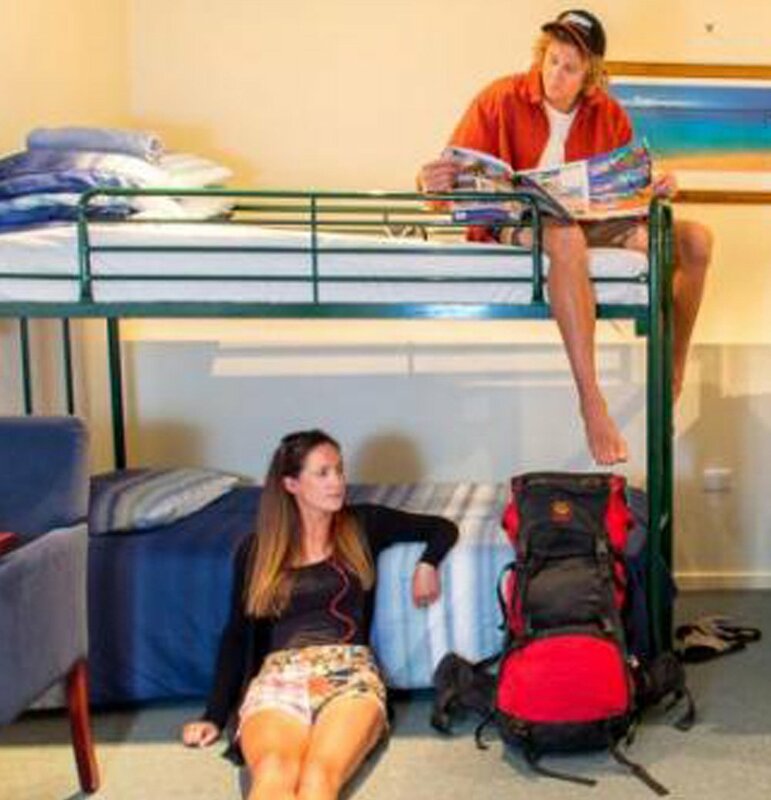 Our depots in both Auckland and Christchurch have several hostels or hotels nearby, so check these out, plan your trip and book some accommodation before (and after) your Escape hire. Cheers. One of the best things about travelling in a campervan throughout New Zealand is the freedom you have to explore this amazing country of ours. But with that freedom, comes responsibility! We need all of our Escape campervan hirers to respect and protect the environment, particularly when choosing where to camp. There are over 6,000 camping sites throughout New Zealand and many are free or cost very little. And because there are so many great campsites available, Escape Rentals does NOT support or recommend freedom camping (where you simply pull up where you want and camp for the night). Why risk a $200+ fine to save a few bucks when there are so many other free or cheap options? To help you plan where you should camp, download one of these apps which will provide you with information featuring thousands of campsites (live availability), key attractions and popular activities. conservation (DOC). These are free or low-cost sites ($8-$10 a night) and you’ll receive a guide to these within your campervan. We also have DOC Campground passes available to purchase. If you are travelling in one of our ‘Certified Self-Contained Vans’ you’ll be able to stay at campgrounds designated as ‘self -contained vehicles only’. But don’t sweat it if you’re in one of our non-certified vans. As mentioned above, there’s literally thousands of campsites and camping spots throughout NZ available for you to use. If you do choose to Freedom Camp, well, that’s your call, but always check with the local I-site (information centre) first and check the Camping our Way website for more information. We want to ensure our hirers have a safe and enjoyable journey around New Zealand, so we’re playing our part. Every hirer will receive a copy of the ‘What’s different about driving in NZ’ handbook when you collect your campervan. Please read it and familiarise yourself with our rules and driving conditions. You will also receive a pre-arrival email from Escape filled with useful travel tips. There’s also a link within that email to a video which our hirers MUST watch before commencing your NZ road-trip. Here it is again for you to check out. Now this part is really important. Escape is also supporting the NZ Tourism Industry Association, the NZ Transport Authority and the NZ Police with their efforts to improve international driver safety. So please check out the following website: www.drivesafe.org.nz This is a new site aimed at educating our international visitors about driving in New Zealand. Guys – This is all about keeping you all safe on our roads. If you’re not comfortable with this, if you’re uncertain about driving in unfamiliar conditions, if you lack driving confidence or competence, you need to ask yourself if a self-drive holiday is really right for you? Have a look at this ‘Driver Assessment Form’ to check how prepared you are to driving in NZ (We’ll be presenting you with this document when you collect your van also.) But if you are an experienced, safe and considerate driver, if you’ve checked out the websites above and completed the online driving test, that’s great. Travel safely with Escape. You won’t regret it. That’s all for now. Be safe. Enjoy your journey. 24 Hour Roadside Assistance for peace of mind. Standard insurance (Option A) which can be upgraded. Take a look at your insurance options. Our self-contained vans also feature a portable toilet. Insurance: You may want to upgrade your standard insurance so that you have nil liability when travelling with us. click here to see all our available insurance options. Optional accessory items are not included but are available for hire (picnic table, BBQ, ) check out our optional accessories. Transmission guarantee is not included. We have a mix of both manual and automatic transmissions. You can state your preference when you book, but if you NEED a specific transmission, you can pay a transmission guarantee fee of $10 per day which guarantees your choice of transmission. If you are looking for the van dimensions because you’re booking a ferry crossing with Bluebridge Cook Strait Ferry, book it under the following category: ‘car/van/ute>5.5meters’ and enter ‘Escape’ under the promo-code field to receive your discount. To find out more about booking your ferry. Make your ‘Great Escape’ a bit ‘greater’ by adding a few extra items to your hire. The prices are listed below and can be accessed by ticking the appropriate box within the ‘Quick Quotes and Bookings’ form.